Looking westward, the site of freshly turned soil pierced by bright green shoots of newly planted crops is hardly a unique one in the Hudson Valley. Nor is the glorious panoramic backdrop that frames the fenced-in fields. Even the cadre of animated youth working them is becoming a relatively commonplace scene on some of the newer farms popping up locally. The underlying tenets of the place; sustainability, knowing where one’s food comes from, and contributing to a community food culture dovetail nicely as a part of a larger movement in the region. It is only when ones turns around and faces eastward, with Ward Manor, the Stargon and Residence halls of Bard College rising before them that the unique location of this farm is readily apparent, one of several characteristics that differentiate it from others similar in scale and scope. The Farm at Bard College, which was started in 2012, produced an impressive harvest in its first season, including over 30 varieties of plants including kale, lettuce spinach and peppers. In addition to area restaurants and a local farmers market, the farm sells its produce to Chartwells, the on-campus dining service at Bard. Altering the buying habits of larger food service companies is an important and if successful, potentially paradigm shifting concept. Changing the way institutional food is looked at, acquired and consumed, is an important contribution the farm has already made to food culture. I spoke recently on the phone with the Farm Coordinator, John-Paul J Sliva. A true food activist, he has been practicing organic farming for 7 years. Prior to starting the farm at Bard, he has been involved with improving school lunches built community gardens and has raised money for farmers whose crops have been wiped out by natural disasters. He explained that the growing movement of knowing where one’s food comes from extends to students as well. It is refreshing to see the young people today exhibit a greater awareness and responsibility for the earth’s sustainability and community oriented food production. 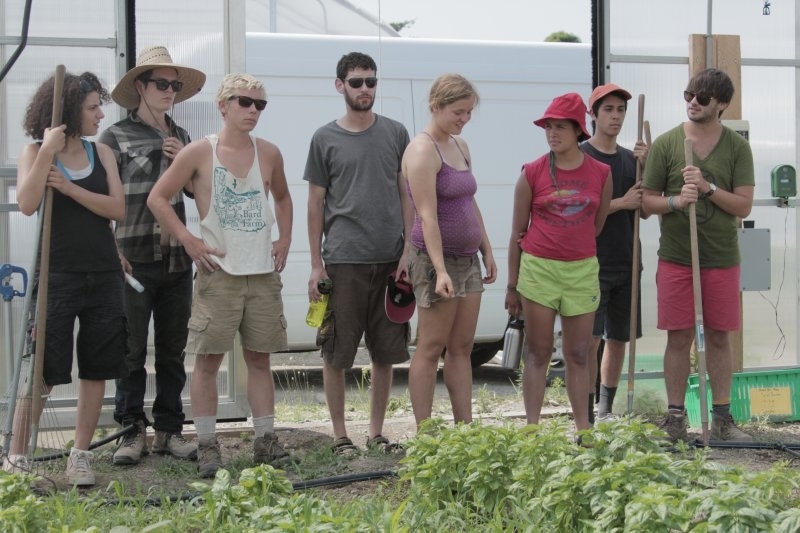 Some of the more than 40 students working on the farm are in work-study programs, while others are volunteers. In hosting field trips, painting and academic classes, the farm is being integrated into the larger educational picture as well (the farm can also be found on the edible schoolyard project) . As if all of the above wasn’t enough to make the farm stand out, one of the most intriguing aspects of the farm for me is that it is home to the largest cranberry bog in the Hudson Valley. Who knew they even raised cranberries around here? While not quite on the scale of the large bogs of New England and Washington State, the fact that new crops are being developed in this area has an enormous appeal to me. I checked the Farm's online store in hopes of buying some. Although they are currently sold out, I have the page bookmarked for this season and will be keeping a watch! The Bard College Farm has its own website with photos, information, and on online store. If interested in making a donation to support this effort., you can do so by clicking here. Apr 29 A Decade of Daffodils at Schoolfield: Maybe It’s Not Mayfair Yet, But Good Enough for Me.